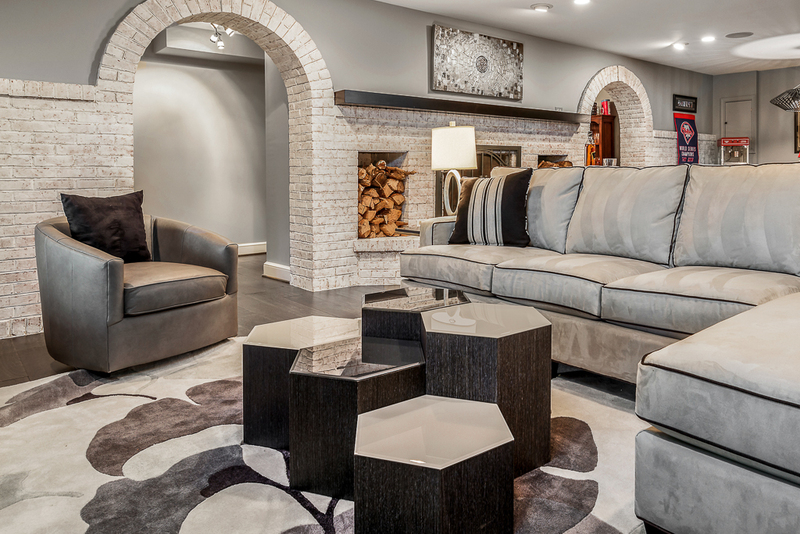 By Sandra Hambley | Jul 19, 2018 | Posted in " basement, interior decorating, Interior Design, modern "
Signature Design Interiors enjoyed transforming this family’s traditional basement into a modern family space for watching sports and movies that could also double as the perfect setting for entertaining friends and guests. Multiple comfortable seating areas were needed and a complete update to all the finishes, from top to bottom, was required. A classy color palette of platinum, champagne, and smoky gray ties all of the spaces together, while geometric shapes and patterns add pops of interest. Every surface was touched, from the flooring to the walls and ceilings and all new furnishings were added. 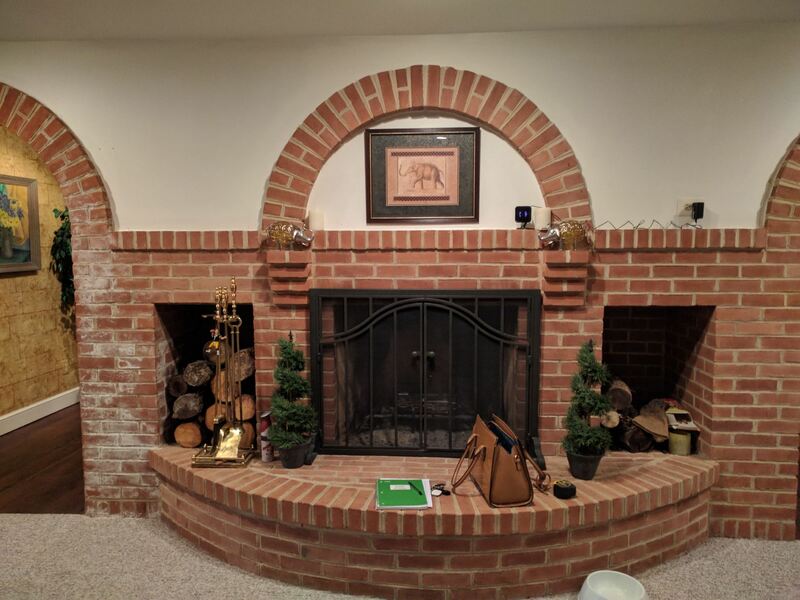 One of the most traditional architectural features in the existing space was the red brick fireplace, accent wall and arches. We painted those white and gave it a distressed finish. Berber carpeting was replaced with an engineered wood flooring with a weathered texture, which is easy to maintain and clean. In the television viewing area, a microfiber sectional is accented with a series of hexagonal tables that have been grouped together to form a multi-surface coffee table with depth, creating an unexpected focal point to the room. A rich leather accent chair and luxe area rug with a modern floral pattern ties in the overall color scheme. 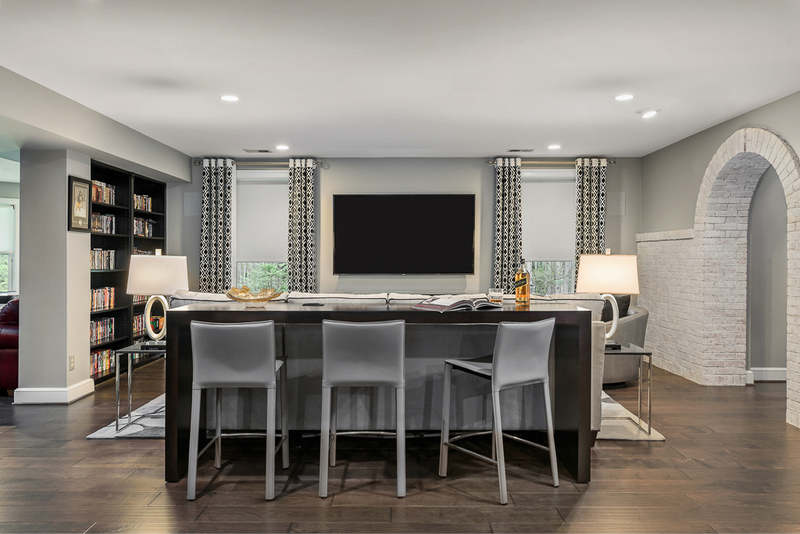 New geometric patterned window treatments provide the perfect frame for the wall mounted flat screen television. Oval table lamps in a brushed silver finish add not only light, but also tons of style. Just behind the sofa, there is a custom designed console table with built-in electrical and USB outlets that is paired with leather stools for additional seating when needed.Floor outlets were installed under the sectional in order to get power to the console table. How’s that for charging convenience? 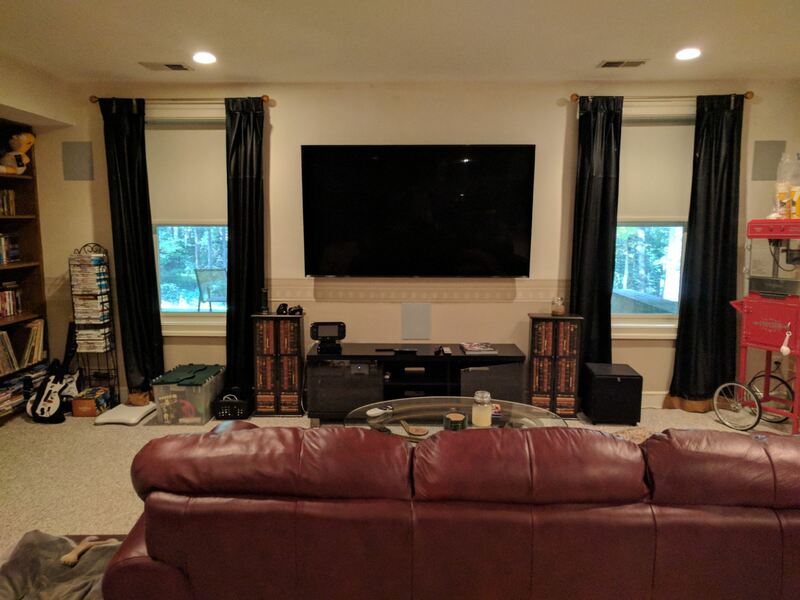 Behind the TV area and beside the bar is a small sitting area. It had an existing metal pendant light, which served as a source of design inspiration to build upon. Here, we added a table for games with leather chairs that compliment those at the console table. 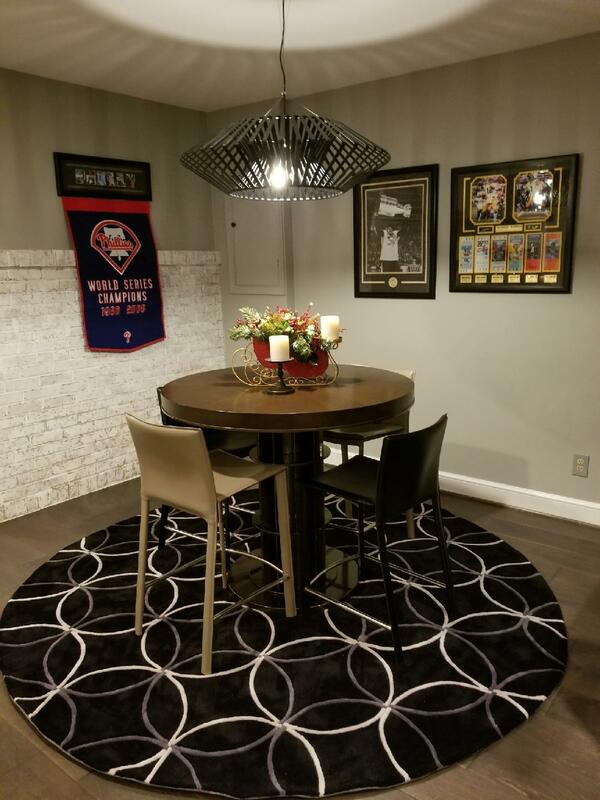 The family’s sports memorabilia is featured on the walls and the floor is punctuated with a fantastic area rug that brings in our color theme and a dramatic geometric pattern. 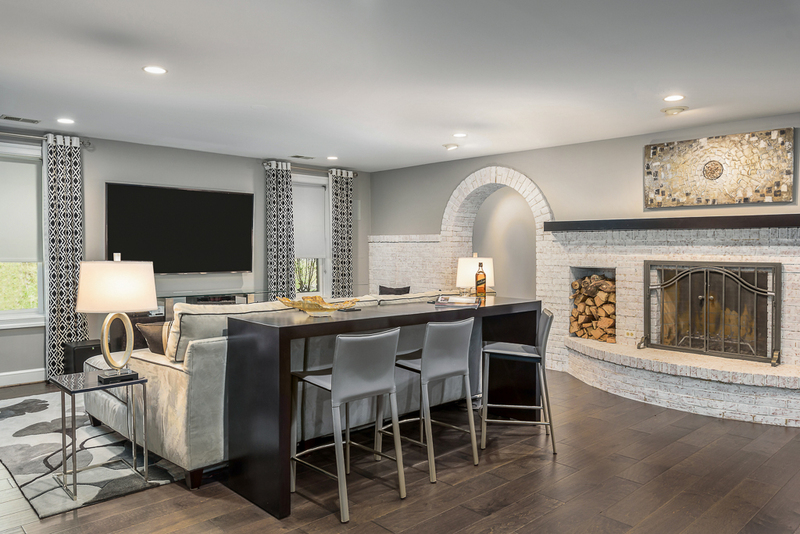 We are so pleased with the results and wish our clients many years of cheering on their favorite sports teams, watching movies, and hosting great parties in their new modern basement! » Do You Have A Passion for Decorating?